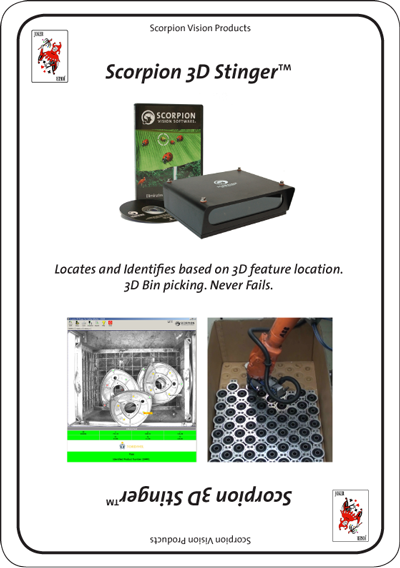 A standard Scorpion 3D Stinger for Robot Vision system consists of a Scorpion 3D Stinger™ Camera mounted on a robot or over the crate, part or conveyor. The camera is connected to an Industrial PC running the Scorpion 3D Stinger software. The Scorpion 3D Stinger software communicates with robot from all major vendors systems over rs-232 or tcp/ip. Today parts are often picked and stacked manually. Manufacturers spend a lot of time and resources shifting or organizing parts in the manufacturing process or feeding robots and machines with parts. To pick unordered parts requires that the robot can recognize the parts from many angles, and that it knows where in space to pick.